Living (the best of) Life in My Dreams: Really Cute/Sweet Children's Book - My Review of When Do I Love You? 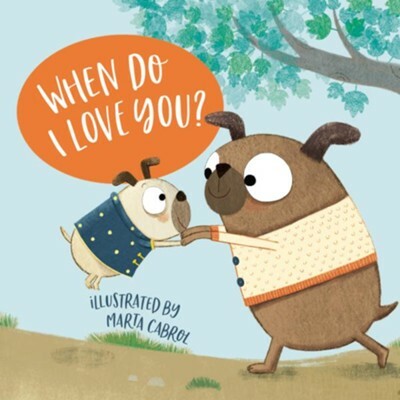 Really Cute/Sweet Children's Book - My Review of When Do I Love You? I always enjoy giving books to my nieces and nephews and I was happy to have the chance to read and review When Do I Love You? so that I can pass it on to one of them. I couldn't stop thinking of my little niece who will be born soon as I was reading this book, imagining my brother reading it to her and sharing his love for her in that way. The pictures in this book are cute, interesting, and fun. This is a good book for babies but also for toddlers and kids who are a little older. It would be a good book for a child to have when they are young and keep reading as they grow up. I love how this book shares the unconditional and always-present love that a parent has for their child. The text is easy to read and sweet. The size and shape of this book is nice. There is nothing that I particularly didn't like about this book but it is important to note that it does not have any out-rightly Christian content in it. It does not mention God. Overall, I thought this was a sweet book. I give When Do I Love You? 5 out of 5 stars.